I have so much scrap fabric, this was a great destash project! Below you will see, my supplies and my ipad. The screen shows that I had already gone to the pin link. This was on my "sewing 101" board on my Pinterest page. 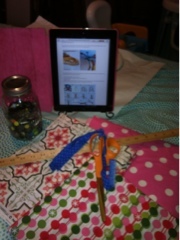 The pin is for fabric bracelets made by braiding. I saw a friend wearing a bunch of them a week ago and I really wanted one of my own. This was a great opportunity to try it! The pin leads to a tutorial for 12 different versions, one includes using a button or bead to anchor it with, which is why the buttons are out. But I didn't end up using that pattern. I picked out some fabric I like and went from there. 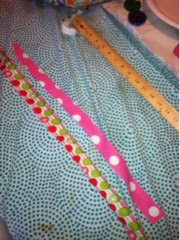 Step 1 was pretty simple, lay out and measure your fabric into the strips needed. I only needed 2 strips for the pattern I picked, so away I went! 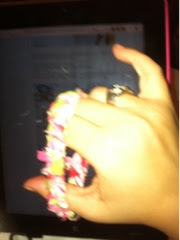 Sorry for the terrible picture, but I promise I will get better and the bracelet was quite lovely and soft! I assure you it is a super cute bracelet and the pin was a lot of fun to make!